Accommodation in Knutsford (including hotels, guest houses & bed and breakfast) is wide and varied to suit all types of clientele. Whether you are on business or vacation you can be rest assured there is something special for you. At the top end of the market Knutsford can boast of The Mere, Mere Court and Cottons while at the budget end, the IBIS Budget is probably the cheapest accommodation available and a little out of town. Hotels and accommodation offering bed and breakfast located in the town centre include The Angel, Rose & Crown, Cross Keys, Belle Epoque and The Court House (coming soon). The Longview Hotel is also in Knutsford, just a two minute walk from the centre of town. Address: Warrington Road, Mere, Knutsford WA16 0RW. Mere Court Hotel was originally built as a wedding present for William and Amy Dunkerley in 1903 and has now been lovingly and skilfully restored as a 4-star deluxe country house hotel and award-winning wedding venue. This hotel has played host to a number of notable and famous guests like former US President Bill Clinton, Ruby Wax, Dawn French, Alan Titchmarsh and Spandau Ballet. Trip Advisor August 2017. Address: Manchester Road, Knutsford WA16 0SU. The 4 Star Cottons Hotel and Spa has unique character and luxurious yet comfortable surroundings, this delightful hotel brings contemporary style accommodation into the heart of Cheshire. Trip Advisor August 2017. Address: 51-55 Manchester Road, Knutsford WA16 0LX. The proprietors believe that being the only independent hotel in the area, that they can offer that friendly difference which lifts them far and away from the chain hotels. As soon as you step into their cozy reception you feel the difference, greeted by the warmth of the crackling open log fire on those cold winter nights to a friendly smile from our members of staff. A service where nothing is too much trouble. Trip Advisor August 2017. Address: M6, Knutsford WA16 0TL. This is a straightforward hotel, just off the M6 motorway, The bright rooms come with custom-designed beds, desks, flat-screen TVs and limited free WiFi. They also include tea and coffeemaking facilities. Family rooms add foldaway beds. Children age 15 and under stay free in their parents’ room. Address: Chester Road, Tabley, Knutsford WA16 0PP. An Ibis budget hotel, – essential comfort at an affordable price. Ibis budget Knutsford hotel is located at Junction 19 of the M6 motorway, en route to Manchester City Centre and Manchester Airport. Knutsford is also the gateway to Cheshire and the North West, perfect for both business and leisure travellers. 32 Cocoon rooms for up to 2 people with bath. Flat-screen TV. Free wifi throughout. 24/7 reception. Free on-site car-park. 100 percent non-smoking. Trip Advisor August 2017. Address: Mereside Road, Bucklow Hill, Knutsford WA16 6RD. Address: 52 King St, Knutsford WA16 6DT. The Cross Keys is an 18th century traditional inn, in the pretty market town of Knutsford in Cheshire. We offer a variety of rooms, free Wi-Fi and a friendly atmosphere. Make the Cross Keys the Pub and Hotel of your choice in Knutsford. Address: 96 King Street, Knutsford, WA16 6HQ. 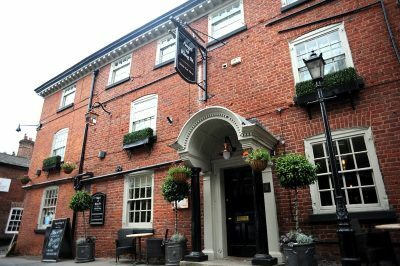 Featuring free WiFi and a restaurant, The Angel Hotel in King Street offers accommodation in the centre of Knutsford. Guests can enjoy the on-site restaurant and bar. The hotel also hosts live entertainment on Friday and Saturday nights. Rooms have a flat-screen TV with satellite channels. Each room has a private bathroom equipped with a shower. For your comfort, you will find free toiletries and a hairdryer. You will find luggage storage space at the property. Taken from Trip Advisor March 2018. Address: 62 King Street, Knutsford, WA16 6DT. The Rose & Crown Hotel is a 350 year old listed building in the heart of the town. Recently under new management, with refurbishments completed in most areas the Restaurant serves up a traditional English Fayre in pleasant surroundings. All rooms have at least a double bed and en-suite. The Rose & Crown Hotel also offers rooms with King sized beds, and family rooms that cater for a King sized bed plus a roll away bed for an extra guest. A large open decked terrace lies adjacent to hotel and car park. Address: Pickmere House, Park Lane, Pickmere, Knutsford WA16 0JX. Pickmere Country House is a Georgian grade ll listed former farmhouse dating back to 1772. Commanding picturesque views over the surrounding countryside the house is situated in the centre of the village of Pickmere. The house is fully licenced and serves evening meals Monday-Thursday 6-7:30pm. Lunches, Afternoon Teas and Weekend Dinners by prior appointment. There is a local pub within easy walking distance and there are also some great gastro pubs and restaurants within an 8 minute drive. Situated in the heart of Cheshire it is ideally placed for both the business traveller and leisure guests who wish to explore all that Cheshire has to offer. Address: Mosswood, Seven Sisters Lane, Knutsford WA16 8TH. Price Range: £124 – £150 (based on average rates for a standard room). A Mon-Fri accommodation package for £250, checkout on Friday morning at 11.00 is offered together with, a Fri-Mon package for £250 checkout on Monday morning at 11.00. Whether you’re working away or looking for an idyllic base to explore the region, Moss Wood’s lodges will give you a true home from home experience. Recently restored to its former glory this 1930’s country house oozes period character and charm. Guests can expect a warm welcome from its owner and housekeeper as well as: a welcome ‘essentials’ hamper, fresh linen, DVD/CD player and Wi-Fi broadband. Within its 10 acres it boasts an orchard, a stunning lake, secret garden and ancient woodland. Trip Advisor August 2017. Address: 60 King Street, Knutsford WA16 6DT. Cooked breakfast, available from 7.30am. The ‘Petit Chateau’ This iconic, venue with 2AA Rosettes for the food is situated in the heart of Knutsford, Cheshire and has been owned and run by the Mooney family for over 43 years. The La Belle Epoque restaurant is a nineteenth century building designed by Richard Harding Watt who was fascinated by Italian and Moorish (North African) architecture. Knutsford is famous for his work as his designs can be seen in several places around the town, on the memorial tower to Mrs. Gaskell and the houses in Legh Road, Drury Lane and Moorside.